Several days ago, I wrote about the Five Feet of Rain that we'd received in Auburn this winter - the most rain we've measured since moving to Auburn 16 years ago. Recent media reports confirm that the winter of 2016-17 has been record setting - the Scripps Institution of Oceanography reported this week that "Northern California just surpassed the wettest year on record." Last night, somewhere on the internet, I read the term "in living memory." Perhaps it's a function of turning 50 next week, but "in living memory" seems to have particular significance for me in the context of my age and this winter. As a rancher, my memories of weather (and other natural phenomena) seem especially important at this stage of my life. In some respects, living memories of weather are like living memories of other significant events. They are important for succeeding generations to know and learn about - often to the chagrin of those succeeding generations, I'm sure. I imagine the grandchildren and great grandchildren of ranchers who lived through the California floods of 1864 or the northern Rocky Mountain blizzard of 1887 got tired of hearing granddad talk about those events. I suppose some baby boomers got tired of their parents recalling the Dust Bowl. I imagine my own grandchildren (should I have any) will get tired of me talking about the Big Dry of 2012-2015 and the monster winter of 2016-2017. But maybe they won't - maybe they'll be like me. As our 500-year drought worsened, I sought out firsthand accounts of the Dust Bowl (most notably in Timothy Egan's fantastic book The Worst Hard Time). I read with interest the account of California's epic flood of 1864 in The West without Water by B. Elaine Ingram and Frances Malamud-Roam. As a rancher, I find that my daily life (and my livelihood) are so closely connected with weather and climate that I pay close attention - perhaps more attention than a normal person! An Australian researcher noted that during that country's prolonged drought, many farmers and ranchers were checking the weather apps on their smart phones 20-30 times a day. During the depths of our recent drought, I found myself looking at multiple forecasts each day for some glimmer of hope. My memories of that time inform the current management of our sheep. We're cautious about making sure we go into the fall months with enough forage to hold the sheep until spring. We spend more time planning our grazing months in advance. We're even more convinced that resting some pastures during the growing season is an important insurance policy against extended dry periods. Other weather events have been equally memorable. 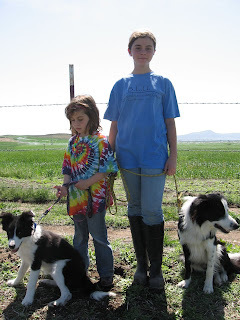 In 2006, the first year we tried pasture lambing (in Grass Valley), it snowed once a week for 6 weeks during lambing. In December 2009, we had to take hay to our sheep and to some cows we were grazing for a friend - because we had eight inches of snow in Auburn! In the summer of 2008, we had about 6 weeks of hot weather and wildfires burning to the east of us - the skies were so smoky that it seemed like we had fog. We lost handful of lambs to pneumonia and I had heat exhaustion on a couple of occasions. Each of these events have stayed with me - and they inform my preparations for extreme weather today. Not surprisingly, researchers have found that farmers and ranchers who have gone through a drought (or other extreme weather events) are better equipped to deal with them the next time. They know what works (and just as importantly, what doesn't work). They are more confident in their decisions. Ranchers who are going through these extreme events for the first time describe feelings of anguish, uncertainty, and powerlessness. Ranchers also talk about the value of learning from their peers - from other farmers and ranchers. Living memory, then, is an important tool in adapting to our increasingly variable environment. Just as I recall the significant weather and climate-related events of my childhood (the hard freeze in Sonora in 1972, when it got down to 4 degrees; the drought of 1976-77; the Stanislaus Complex fire of 1987; the lingering drought during my college years of 1985-1990), my daughters will remember the Big Dry and the winter of 2016-2017. They'll remember the Rim Fire, the King Fire and the Butte Fire - each of which affected people and landscapes we know. At some point (in 60 or 70 years), they'll be among the few who will have living memories of these events. Hopefully their grandchildren will listen to (and learn from) their stories! Sustainable farms and agriculture helps the people to get their natral food supplies in an easy and quick way. These farms has lot to offer in terms of production and shelter.